Few details about Washington’s youth are known to history. Because the world was starving for stories about the revolutionary war hero, Mason Locke “Parson" Weems spun a fantastical biography about him in 1800, the year after his death. 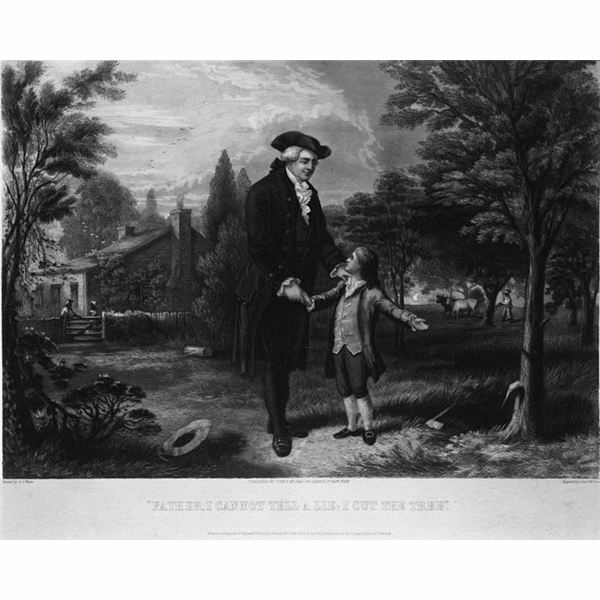 The most famous, enduring and most certainly false tale is of Washington and his father’s cherry tree. While testing his new hatchet on “the body of a beautiful young cherry tree" he accidentally chopped it down. When his father asked him who killed the tree, he nobly confessed. “I can’t tell a lie, Pa. You know I can’t tell a lie." His father swelled with pride at his son’s honesty and called him to his arms. “Such an act of heroism in my son is more worth than a thousand trees," he told young Georgie, “though blossomed with silver, and their fruits of purest gold." But all good myths are based in truth. Washington acted with integrity and non-partisan fairness throughout his military and political career. Washington grew up on Ferry Farm on the Rappahannock River, near Fredericksburg, Virginia. His father, Augustine, certainly owned cherry trees there, as well as tobacco and other crops. Augustine was an ambitious farmer, mill builder and mine owner. He acquired land and slaves, moving his family from Westmoreland County, Virginia, to Mount Vernon and eventually Ferry Farm. Washington was educated at home and by the local church sexton. He studied math, geography, Latin and English classics. He spent much time with backwoodsmen and the foreman of his father’s plantation. By the time he was a teenager, he was an expert at tobacco farming, ranching and surveying. Washington’s great-grandfather immigrated from England to Virginia in the early 17th century. He was granted land there by Henry XIII. Little is known about the family until the birth of Augustine in 1694. In 1759, Washington married Martha Dandridge Custis, a widow with two children. They would have no children of their own, but he would raise her children with love. It was his step-grandson, George Washington Parke Custis, who shined some truth on the silver dollar myth. The tall-tale states that Washington, being of legendary strength, once threw a silver dollar across the Potomac river. First of all, silver dollars were not in circulation in Washington’s day. Second, that dollar would be worth about $25, relatively speaking. Even a wealthy man like Washington wouldn’t be throwing that around. Third, the Potomac is around a mile wide. Paul Bunyan couldn’t make that throw. But Washington’s step-grandson tells the story in his memoirs about him throwing a piece of slate about the size of a dollar across the Rappahannock river, which is about 250 feet wide. A mighty, but not impossible toss. When Washington was eleven, his father died. His older half-brother, Lawrence, took over his upbringing. Lawrence married Anne Fairfax, daughter of Colonel William Fairfax. Colonel Fairfax would teach Washington many things about surveying and military strategy. When he was sixteen, Washington accompanied a surveying party into the western reaches of Virginia. The next year, with the assistance of Lord Fairfax, he was appointed the official surveyor of Culpeper County. Washington spent the next two years busy surveying the countryside. He developed an interest in westward expansion. His exploration of the western borders of Virginia put him face-to-face with the French-British territorial conflicts. The boundaries were under dispute. The French military were taking up positions in the Ohio Valley to protect settlers and fur trappers. October 31, 1753, Virginia’s Lieutenant Governor Robert Dinwiddie sent Washington to Fort LeBoeuf, Pennsylvania, to warn the French that they were occupying British territory. The French refused to move. Dinwiddie sent Washington back, with troops this time. His force attacked a French post, killing the commander and nine soldiers. The French and Indian War began on that day. 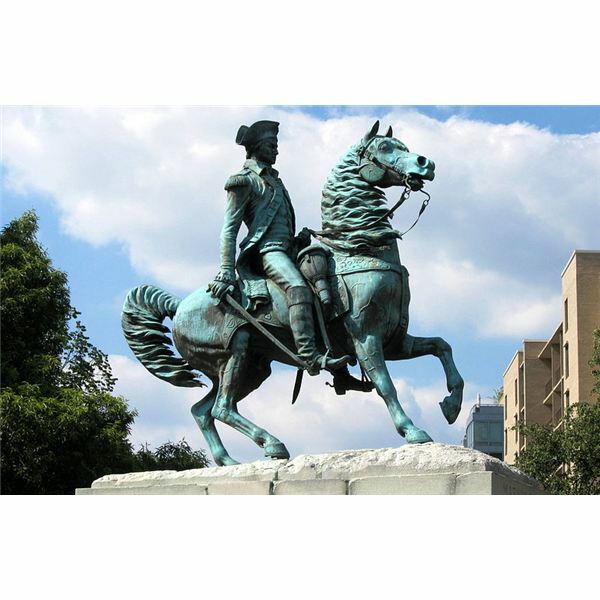 Washington served with British General Edward Braddock in Virginia. Braddock was mortally wounded in an attack on the French. During that battle, Washington received four bullet holes in his coat and had two horses shot from under him, but was uninjured. He was named commander of all Virginia troops after Braddock’s death. Poorly disciplined troops and a lack of support from the legislature were constant frustrations for Washington. He long to return to the life of a gentleman farmer. He resigned his post in the militia, married Martha and spend his time tending their numerous acres. He enjoyed the life of the landed gentry, which included horseback riding, fishing and fox-hunts. He was an innovative farmer: breeding stronger livestock, rotating crops and staying current on agricultural advances. He was known to take of his coat and do dirty jobs with his laborers. Although he owned over a hundred slaves, he disliked the practice but accepted it as custom and a business necessity. In his will, he freed his slaves and his estate provided for them. 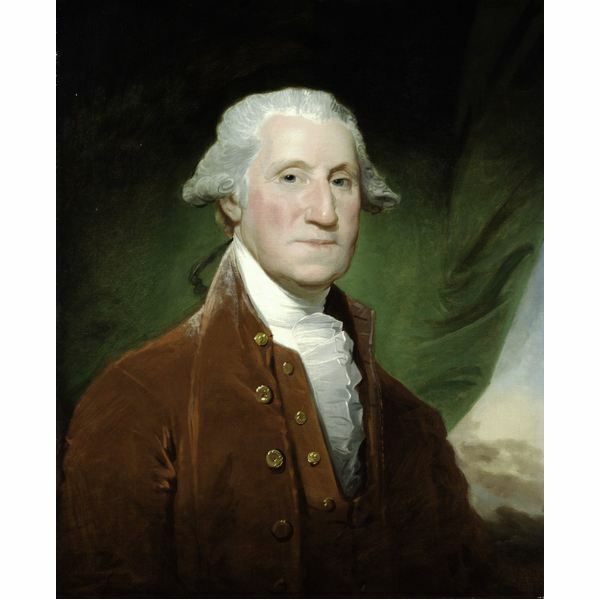 Like many of his social class, Washington was constricted by England’s increasing laws and taxes. He was not the most vocal opposition, but in 1769 he proposed a measure the the Virginia government to boycott British goods until the tax acts were repealed. After the Intolerable Acts were passed in 1774, Washington chaired a committee calling for a Continental Congress and the used of armed force if necessary. He was a delegate in the first two meetings of the Continental Congress. During the second, he was selected to be Commander-In-Chief of the Continental Military. He had the experience and charisma for the job, plus his appointment would bring a Southern influence to a mostly Northern revolution. Much of the action to that point had been centered around Boston and New York. Bringing a Virginian to lead the army would unite the Thirteen Colonies. Washington’s experience commanding small militia groups did not make him completely qualified to lead such a large army. His strategy continued to be guerilla-style. He would avoid head-on contact a strike when his enemy did not expect it. After forcing the British from Boston, he moved his troops into New York City. The new British general, William Howe, arrived in New York with the largest force England had ever sent abroad. 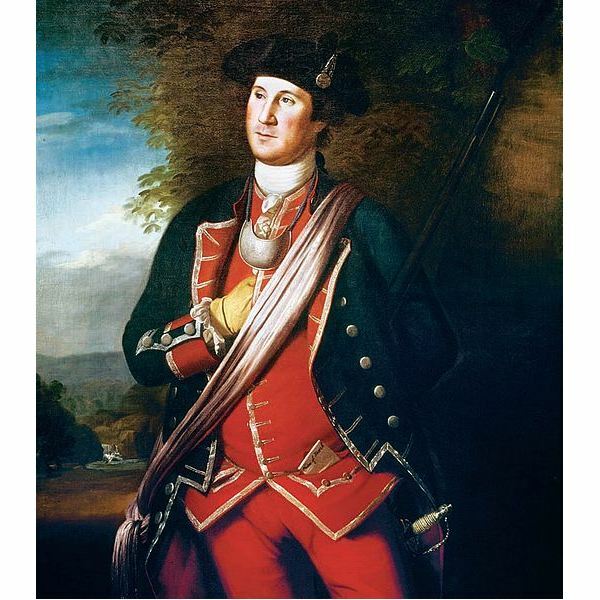 Washington’s army was driven from New York. Washington retreated across the Delaware river into Pennsylvania. Howe wintered his troops in Trenton and Princeton, confident his opponent would not act until spring. His military strategy was to conquer major cities, believing that the Colonies would fall without their centers. On Christmas night, 1776, Washington and his troops crossed the Delaware and surprised British troops in Trenton. A few days later they struck a crippling blow to the British at Princeton. Later that winter came the notoriously brutal period at Valley Forge, where Washington’s 11,000 man army suffered thousands of deaths by disease and starvation. But the remaining soldiers emerged in the spring stronger after their trials. The Colonies soon allied with France. With French soldiers and warships, they turned the tide, eventually defeating General Cornwallis at Yorktown, Virginia, and forcing British surrender on October 19, 1781. Washington attempted to resume his life as a content farmer. His land and family were neglected after years of war. Along with a generous land grant from his military service, he returned to prosperity. But the young republic was struggling. The Articles of Confederation centered power on the individual states. Borders were disputed. They refused to work together to pay off the war debt. They were not unified. In 1786, Congress called for a convention to amend the Articles of Confederation. Washington attended and pushed for a more centralized government. He voted for by all 69 members of the electoral college, making him the nation’s only unanimously selected president. Washington knew he was setting a precedent for American leaders to follow. He surrounded himself with a wise cabinet and listed to advice. He chose to keep his fledgeling nation out of international conflicts, including the ongoing war between France and England. He established the District of Columbia as permanent capitol, although he was the only president never to live at the White House. He placed the country on a sound financial path and established peaceful trade with his neighbors. Although he could have been a king, he preferred the title Mr. President. He chose to retire after two terms, although this would not be the law until the 22nd amendment passed in 1951. Still desperate to resume life on his land, Washington returned to Mount Vernon in 1797. He felt he had much farm work to do. While he had been tending his nation, he had been neglecting his acres. He spent much of one day in December, 1799, inspecting his farm, despite a driving snowstorm. He returned home in the evening, ate a quick supper and went to bed in his wet clothes. He woke in the morning complaining of a sore throat. He was quite hoarse. His illness progressed and he died that evening, December 14. The news spread throughout the nation. Services and eulogies were delivered across the country. The British fleet held a tribute. Even Napoleon called for ten days of mourning. George Washington always conducted himself as a citizen and not a monarch. He put the needs of the people ahead of his own and practiced integrity in everything he did.